I have enjoyed many books from Max Lucado so I was curious to read and review this book that is made especially for children. 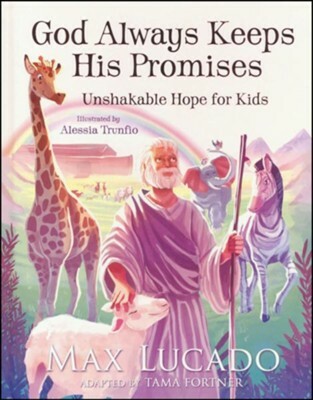 God Always Keeps His Promises: Unshakable Hope for Kids shares many messages from the Bible, promises that God has made. It helps children - and families - grow in their faith. I like the pictures in this book. They are a good mix of realistic and cute. I think that this would be a great gift for families. I plan to give this gift to my brother who has children ranging from babies to elementary school age. I like the overall look and feel of this book. It is a quality book and would make a great gift because of that. I like that this book has a built-in ribbon bookmark. I like that each chapter of the book has a number of Bible verses on the topic discussed. I like that there is a mix of devotional-like content and Bible stories in this book. There is not really anything that I don't like about this book. If I had to complain about something, I would say that maybe the chapters are a little long. Overall, I think this is a great book for families. I give God Always Keeps His Promises: Unshakable Hope for Kids 5 of 5 stars.